Were this current Industrial Revolution (4.0) compared to a marathon race of 26 miles, is to say that this is a pretty crazy race that doesn’t resemble anything like races in the recent past. Kenyan Geoffrey Mutai completed the Boston Marathon in record time, 2hrs 3 mins and 2 secs back in 2011. That’s a pretty insane pace no matter how you cut it, so let’s attribute his achievement to say companies like Google, Tesla, Facebook, Amazon, Apple, Microsoft, SpaceX, Baidu, DARPA, Palantir, Twitter, Netflix – a huge host of unicorn, emerging tech and incredible concepts in A.I. that are emerging at speed these days. All of them are way ahead of the rest of their corporate counterparts – racing on a scale we’ve never seen and embracing exponential acceleration that is unprecedented in human history. 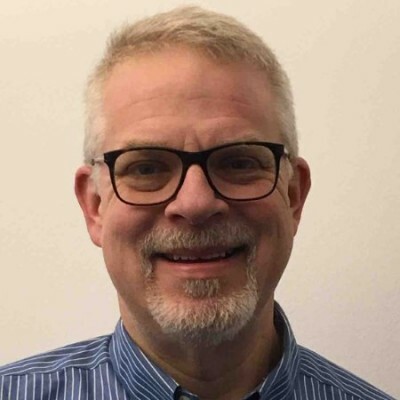 Jeff is a Talent & Innovation Accelerator and Future of Work Consultant for small businesses in the emerging, fast growth high-tech sector, as well as mature businesses under taking digital transformation. His primary focus is on digital transformation & adoption within the talent and human resources function. Somewhere in the middle, the bigger corporates and notable multi-national players such as IBM, General Electric, Boeing, BMW, Volkswagon, Toyota, Novartis, Samsung, Xiomi, etc [add your favourite large technology driven corporate here]. Pulling up the back of the pack you have your amateurs and tryers, getting their get feet wet with what is likely their first or second attempt at a marathon, but still chugging along with will and determination to make their mark on this exciting time in our history. These might be your more Luddite oriented market players for whom technology isn’t at their core, but who still embrace aspects of internet or SaaS tools and services to get their products designed, marketed and off to their customers. Yet it would seem by all accounts that the field of human capital management (HR) is still milling about at the starting line, contemplating whether or not to get into the race. 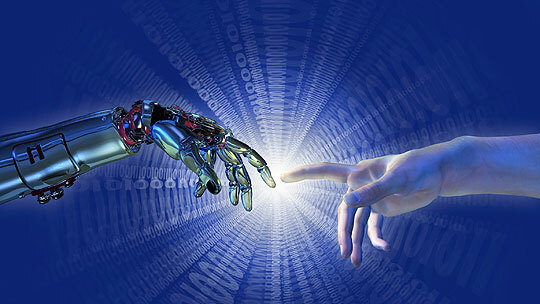 As someone who has worked in HR for over 25 years, in equal measure with well-known global players and virtually unknown high tech startups, and who is now working to accelerate HR’s digital journey, I’m struck by the mixture of reticence, fear, uncertainty and internal influence that my HR compatriots are exhibiting at the mere suggestion of bringing on new technology to usher in the digital revolution (that started for HR like 5 years ago, people). 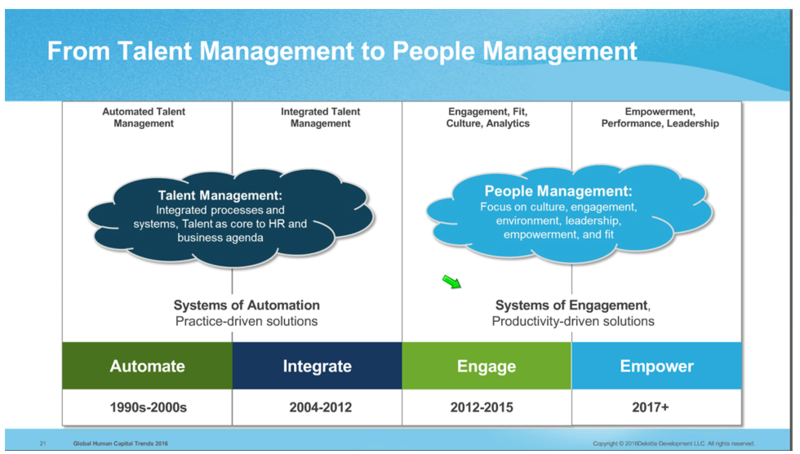 Beyond your everyday ERP or HRIS system, and perhaps some ancillary instances of an ATS or LMS, there is relatively little that HR departments are doing to embrace the wildly expanding pool of HCM technologies exploding onto the market in the last 3 years. Recently Jacob Morgan, a Future of Work expert, deemed HR to be one of the sexiest positions within an organisation, and several articles by Josh Bersin and other HCM luminaries tout HR as being at the centre of change and transformation in this accelerated agree of digital disruption. That may be true for about 8% of the companies on the planet (and I’m being generous here as estimates about the take-up and full level digital maturity for the Fortune and FTSE 100 indicate it’s more like 4%). But the vast majority of the companies I speak to harbour deep doubt, cynicism, fear and commercial ineptitude toward the notion that employees today (dare I label them Millennials for fear of generational discrimination, who will make up 50% of the workforce in FOUR years time), seek seamless continuity between their digital experiences inside and outside of work. For me, it’s like watching an old friend sink into a treatable yet severe illness, suffering the full psychological spectrum of the change curve, shock, anger, denial, depression, despair… But still not accepting the hard fact that they are slipping away every day without accepting that there is actually a cure, if only they’d accept its existence, and embrace its application to go on the mend. There is a clear sense that Human Resources is now considered a central player, not just in administration, compliance and regulatory governance issues – as well as basics such as recruitment, on-boarding, pay and reward, training & development and all of the usual core management challenges – but something quite different indeed. As it turns out – the new focus on the HR department is on engagement, fit, culture, analytics, empowerment, performance and leadership. Of course, I’ve been arguing these were always the areas that we should have been focused on – and with the raft of incredibly powerful tools and technologies to help us all manage this with greater ease – HR should be tripping over themselves to ‘get on that bus’ and lead the way forward. 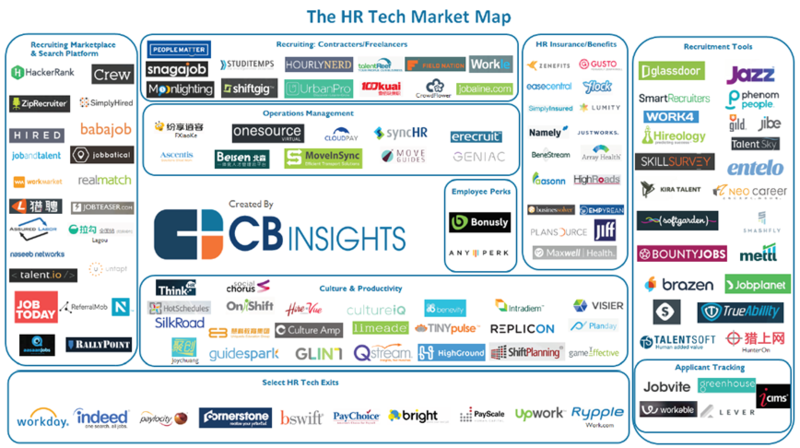 As I sit in between both the HR buyers and the accelerating HCM technology vendors – I see an interesting chasm of thought and understanding and it’s concerning. 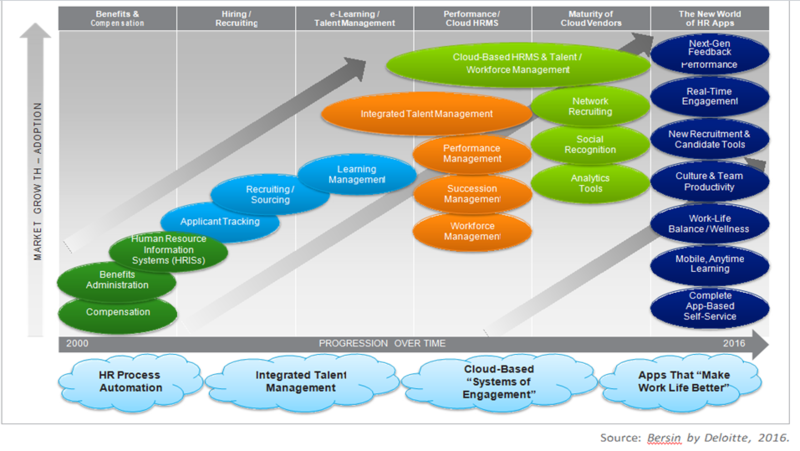 Though I am thrilled to make a living off of this opportunity in my role as HR digital transformation enabler – helping HR buyer and HCM tech vendor connect with one another intelligently, relevantly and in a commercially viable manner – the disconnect between these two worlds is still a bit shocking. When I brought this to Jonathan Ferrar’s attention (formally VP of IBM Kenexa’s Smarter Workforce group), at a recent People Analytics Conference in London – and asked him why he thought this was so – he brought up an interesting challenge I that hadn’t occurred to me. He indicated that there is an older generation slowly making their way to the corporate exit doors – whilst handing over the reins to a new generation of workers who has only ever lived in the digital revolution. As these Baby Boomers – who have climbed the ladder of senior corporate leadership over the course of their often 20+ year careers, they are rather stumped at the rate of exponential acceleration that the HCM tech space is offering, with seemingly dozens of new market entrants coming online literally every month. I personally straddle the generational gap between Baby Boomer and Gen-Xer – with the mind of a digital native Millennial, so hadn’t ever stopped to consider I might be a small percentage of an otherwise more unconnected generational mindset. 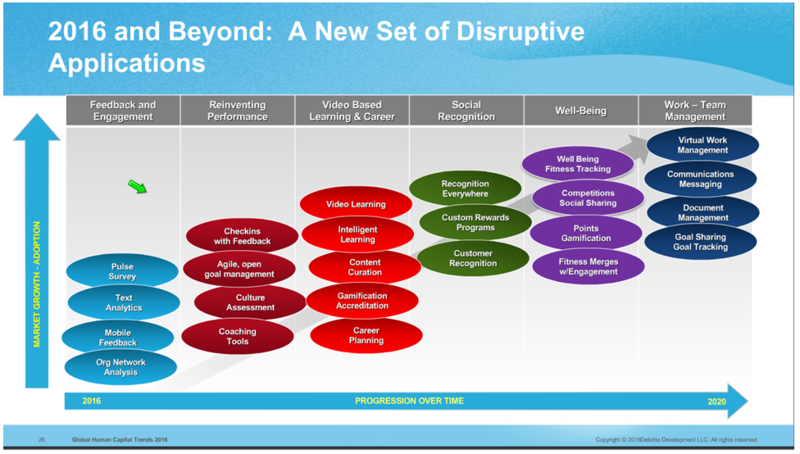 But as Josh Bersin’s disruption report aptly points out – the leaders of this revolution in thinking and enablement aren’t waiting for HR to play catch up… In fact, their inventing ways to digitally enable employees of all descriptions with as many productivity and enablement tools as possible – solving for a problem that clearly they see existing, even if HR fears taking the reins to own it outright. You see, most of the folks who are shaping and building these HCM tools are the very engineers and conceptual geniuses who have dutifully worked to solve a raft of other challenges in human organisations – and frankly are solving for things they’ve suffered through these many years such as complex program and project management, geographic dispersion, hierarchical and silo’d thinking, inadvertent distancing from their end-user or customer, and slow product innovation. The answer to all of these challenges and more lies within the notion that we should be in a direct and constant conversation with the people to whom we’re building and selling our products, as well as with the lovely people who create, build and deliver those products. We should be treating everyone with equal focus, and help empower and enable them to stay connected, to openly collaborate, share thoughts, ideas and anything that will get to the right answers faster. Of course we need to keep the administrative machine ticking over – but if you’re going to help your particular company win this insane marathon – where the Technical ‘Kenyans’ are rapidly approaching (and reinventing) the finish line – you had better (a) get in the race, (b) run like a Kenyan, (c) and embrace every tool, trick, technology and training tip you can to get there NOW! What hyper-competitive, forward thinking companies are doing today is WAY beyond some fancy tech applications to help their people be more productive, they are embracing new ways of organising, working together cross-functionally, sharing expertise openly and willingly, working in two-week sprints to deliver innovation and deliverables at speeds unheard of – and they’ve dropped politics, in-fighting, back-stabbing, territoriality, hierarchical juggernauts, and silo’d thinking in order to instead work directly with customers and employees to create at the speed of invention. 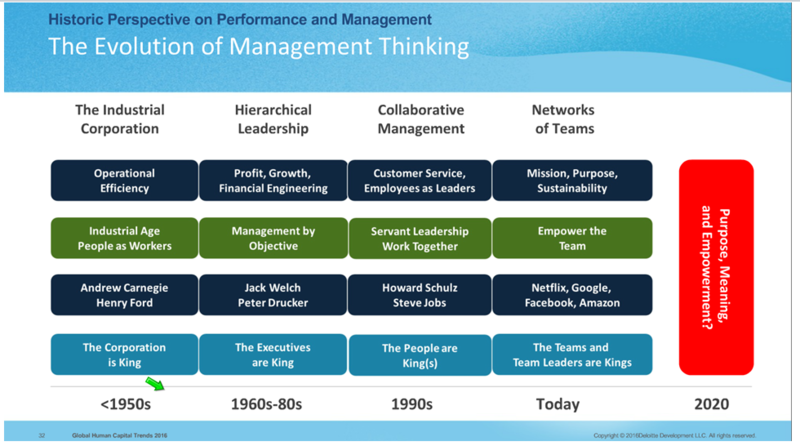 The evolution of management thinking, according to Bersin’s extensive research, shows that we are no longer a 20th century, monolithic and bottlenecked construct – but rather micro-team oriented, fast delivering, and hard driving innovators who are rethinking everything that Fredrick Taylor imagined to be true back in the 1920’s. Competitive advantage therefore will go straight to the organisation that can adapt at a pace of change never before imagined, and which will be heavily disruptive (and sorry folks – a bit disorienting and nerve-racking for a while). If you want the new model for the 21st century’s business – then you’d better read Salim Ismail’s book Exponential Organisations where he outlines the very essence of today’s unicorn tech start-up – where dispersed groups of under 50 people take less than 5 years to re-invent a business model, disrupt an entire industry and be worth over $1 billion. If John Chambers (recently retired CEO of Cisco Systems), is correct about his assertion that 40% of the Fortune and FTSE 100 will cease to exist in the next 7 years – and that the average lifespan of any organisation started in the last 5 years is maybe 15 years long vs. the 100 or so years that the old school dinosaurs of the 20th century are used to living – we are all in for a fairly hellish ride – and a speed of operational reinvention that no one can teach you about because it’s never happened before. Thus, to my dear HR colleagues – who sit squarely in the centre of people driven change, transformation, productivity, performance, learning and development and arguably the future of your organisation in an incredibly tumultuous revolution – please wake up to the challenge, embrace the new world of digital everything – hire whomever you need and beg for whatever budget necessary – but get busy saving your enterprises because a world of new players who are no longer patient with the way things were are now inventing the way things are going to be. I would suggest getting smart quickly about what’s available to you, reach out to field experts, your LinkedIn contacts, online course work, one another, networks of every description – even if it takes you nights, weekends, whatever – to tune yourself into the incredible possibilities now at your finger tips – and engage with agents such as myself who will only be too willing to support your journey into the digital jungle – and help you come out the other side bigger, bolder, enabled, productive and ready to take on the greatest disruptors – now that you have the tools and working know-how to get there.